Sometimes when you’ve stopped looking for a solution is exactly when it pops up. Israel Finkelstein, Jacob M. Alkow Professor of the Archaeology of Israel in the Bronze and Iron Ages, Sonia and Marco Nadler Institute of Archaeology, discovered a very interesting finding in 1998, at the archaeological excavation of Megiddo. He noticed a dig participant who did not quite fit the profile of a typical university undergraduate. “I sniffed around and learned that this particular student was actually a TAU professor flying under the radar. He turned out to be a very important ‘find,’” smiles Finkelstein. That student, incumbent of the Wolfson Chair in Experimental Physics Eli Piasetzky, Raymond and Beverly Sackler Faculty of Exact Sciences, was pursuing a degree in archaeology. Prof. Finkelstein pulled him aside to talk, and so began a research partnership that is still active two decades later. When were early Biblical texts written? The archaeological issue of the day was mapping the chronology of the Iron Age in ancient Israel. Finkelstein challenged Piasetzky to improve the dating of remains from biblical times by using the radiocarbon method. The findings, published in professional and lay publications worldwide, rendered a new timeline of ancient Israel with lasting ramifications for biblical studies. “Until then, the dating of texts was based on Biblical considerations,” explains Prof. Finkelstein, adding, “You can say that Biblical history was the path of the researchers, and archeology was used as a tool to prove the Bible stories were true.” He said. His article caused an uproar among researchers around the world, and he realized that he needed a more accurate dating tool and a talented mathematician to help him. Prof. Finkelstein presented his friend with a challenge – to accurately date the findings discovered in the excavations and to prove his claims. Using the radiocarbon dating method on hundreds of items collected and tested, Prof. Piasetzky and Prof. Finkelstein presented a new and more accurate timeline in the history of ancient Israel, which was published in the New York Times, and had long-term implications for the study of the Biblical period since then. 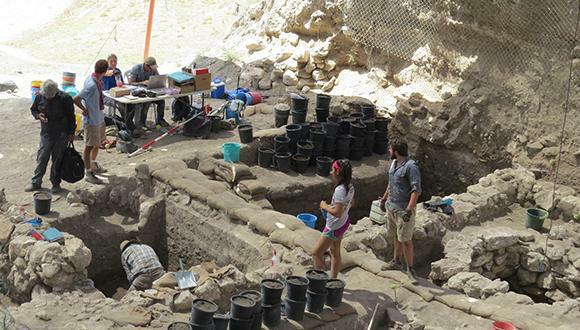 Prof. Piasetzky and Prof. Finkelstein continue their quest to reconstruct ancient history. As reported by The New York Times, they are conducting analyses to help better decipher ink inscriptions on potsherds, known as ostraca that were unearthed at an ancient fortress in the deep desert of Arad in southern Israel. Prof. Piasetzky and Prof. Finkelstein have put together a team of archaeologists, historians, physicists, mathematicians, and computer scientists to analyze handwriting and determine just how many hands penned the Arad ostraca. To do so, they employ physics techniques of multispectral imaging to reveal inscriptions and improve readability. Next, they compare handwriting by using algorithms specially developed by the team. What they found there was surprising: the new lines discovered were a letter requesting the issuance of wine and food from the warehouses of the Tel Arad fortress to one of the military units in the area. The recipient of the letter was the warehouse clerk, while the address was an officer from Beersheba. Beyond the information about what people used to eat and drink during that time, the researchers revealed that even quartermasters knew how to read and write, and also learned a few new words that don’t appear in the Bible. “From the content of the letters we learn that literacy permeated even the low ranks of the military administration of the kingdom. If we extrapolate this data to other areas of Judea, and assume that this was the case in the civil administration and among the clergy, the level of literacy is considerable. This level of literacy is a reasonable background for the composition of Biblical texts,” explains Prof. Finkelstein. A chemist and a physicist walk into a clean room. No, this is not the one about how many people it takes to change a light bulb. Nor is it the one about two Israelis and three opinions. This is a true story about how two doctoral students from different fields got talking and realized that they may be able to use chemistry to solve a nagging problem in physics. “These students were the best kind – curious and open to new ideas and different ways of approaching a problem,” says Prof. Gil Markovich of the Raymond and Beverly Sackler School of Chemistry. Prof. Yoram Dagan, Raymond and Beverly Sackler School of Physics and Astronomy, nods in agreement. Markovich and Dagan were the students’ respective PhD advisors and quickly saw the benefit of collaborating. In their research, they sought a solution to prevent damage to the surface of semiconductors – small components that control electrical current in devices such as computers and mobile phones, which damage the functioning of the devices. For this kind of research, a particularly sterile laboratory is required. The special conditions in the “clean room” include a constant temperature of 20 degrees, 50 percent humidity, and a very powerful filter that prevents the entry of dust particles into the laboratory space and is responsible for creating a sterile work environment. These conditions are essential for the production of certain materials, especially electronic chips, which can be disrupted by something as tiny as a grain of dust. Their invention could improve microelectronics in all the devices we carry in our pockets and have in our homes by making them faster, more efficient and more compact. “This is a long-term project – an idea that may be implementable twenty years down the line. Yet exploring this basic physics problem using nano-chemistry led us to an application that can be realized today,” says Dagan. Markovich and Dagan have teamed up with industry experts for guidance in applying their technology to improve resolution in infrared cameras used for defense and security installations. The Israel Innovation Authority (formerly the Office of the Chief Scientist) has invested in the project with a grant reserved solely for projects that have a good chance to be commercialized in Israel. “It all begins, though, with basic science. Basic science is the foundation of knowledge. When we discover new possibilities and new materials, applications can grow,” stresses Dagan. Markovich and Dagan share a passion for unlocking the secrets of the universe: “We are both interested in origins,” says Dagan. “Gil researches the interaction of minerals with amino acids and DNA – the original building blocks of life. I am interested in the fundamental properties of matter and materials. I would not think up chemical approaches to physical problems by myself. Our collaboration is opening up new possibilities.” says Dagan. Mr. Itamar Cohen was chosen for the first cohort of the Jabotinsky Fellowship in the field of applied science, awarded by the ministry of science to students in the direct-PhD track. In his research, Itamar investigates how intense laser pulses can accelerate electrons to high energies. For decades, these high energy electrons could only be generated at large accelerator facilities. Itamar’s work, however, is conducted at a university-scale laboratory located at our basement at the School of Physics. His experiments are conducted using a high-intensity laser with peak power of 20,000,000,000,00 Watts (20 TeraWatts). The technology which enabled minimizing the size and cost of this intense laser is called “Chirped Pulse Amplification” and its inventors were awarded the Nobel Prize in Physics this year. Itamar’s research aims to generate high-energy electrons in a cheep and compact manner, and to employ them in a range of areas such as medicine, manufacturing, security, and even fundamental studies of our universe. Prof. David Bergman of the Condensed Matter Physics Department, has been elected President of ETOPIM, the Society for electrical, transport, and optical properties of inhomogeneous media. The research was led by Prof. Eli Piasetzky of Tel Aviv University‘s School of Physics, Prof. Or Hen of the Massachusetts Institute of Technology (MIT), and Prof. Larry Weinstein of Old Dominion University. The graduate student who analyzed the data was Meytal Duer of TAU’s School of Physics. “This finding may shake up scientists’ understanding of how neutron stars behave,” says Prof. Hen of MIT’s Laboratory of Nuclear Science. “This trend suggests that, in objects with high neutron density, the minority protons carry a disproportionally large part of the average energy,” says Prof. Piasetzky. Research for the study was based on data previously collected by CLAS — the CEBAF (Continuous Electron Beam Accelerator Facility) Large Acceptance Spectrometer, a particle accelerator and detector based at Thomas Jefferson Laboratory in Virginia. The team chose to mine data collected during a 2004 experiment in which electrons bombarded carbon, iron and lead nuclei, with the goal of observing how particles produced in nuclear interactions travel through each nucleus’s respectively larger volume. Eventually, the team observed that as the number of neutrons in an atom’s nucleus increased, the probability of protons having high energies (and having paired up with a neutron) increased significantly. The probability for neutrons to have these high energies remained the same.